The Cuyahoga County Office of Homeless Services Advisory Board voted this week to eliminate funding for a number of transitional housing shelters in Cleveland. Only three individuals (including the two NEOCH appointed representatives) voted against this plan. It is another march toward elimination of the transitional shelters in America and a huge loss for Cuyahoga County. 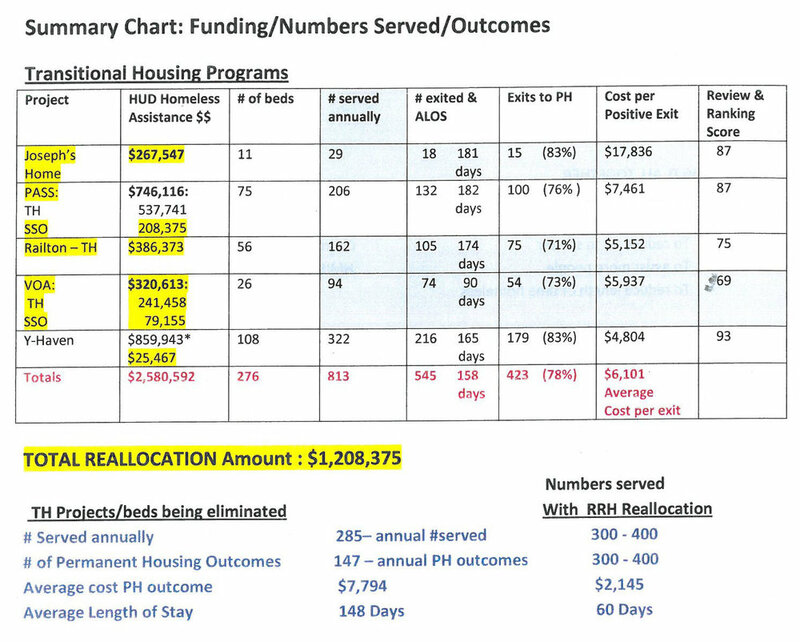 The feds created this situation by authorizing only 85% of the funding need to renew all the shelter and homeless housing programs in the community. The 15% would have to compete against all the other programs in the so-called "Tier 2." This second tier programs will only get 1 point for supportive services such as outreach, education or alcohol services. Transitional shelters get 3 points while housing programs or rental assistance get 10 points in this second tier. Communities will be forced to prioritize housing programs or risk losing in the competition and thus losing that 15%. Cuyahoga County officials have decided to use all the below funding for rental assistance. In 2016, youth and singles will be eligible for rental assistance while today only seniors and families are eligible. The above chart shows the programs that will be eliminated. Keep in mind that one year of rental assistance is worth about $6,000 per person. The reason that the feds and the County staff do not like transitional programs because they are too expensive when compared to the success rate and there are too many people who fail out of the program. You can see those two issues reflected above. What does this mean for Cleveland? At this time the women and family system is a disaster with long waits for housing and the women's shelter extremely overcrowded. Why are things so bad? In my opinion it is because we shut down all the transtional programs for women and families. We lost East Side Catholic, Family Transitional, THI, Continue Life, Triumph House and the County funded programs at Hitchcock and University Settlement. Now the five women/family shelters are clogged beyond what should be discussed in County administration building. Note to Conwell check it out any night at 10 p.m.ar 1722 Payne Ave.
Y-Haven will find additional assistance from the Medicaid System to preserve the program. Joseph's Home and PASS are going to get additional funding from the County to preserve those beds. The Transitional Shelter for males age 18 to 24 will lose public support and the Railton House Transitional Shelter will also lose the support. This will mean that 82 transitional beds are on the short list to be lost in 2016. Unless the Volunteers of America and Salvation Army can find additional funds to keep these facilities open, it will be a huge blow to the men's programs. Transitional beds are beds that turnover. Permanent beds do not. It will cause the kind of backup that the women are experience at Norma Herr. If this plan is accepted by the feds, we will have more money for rental assistance.